Transportation of Belaza is carried out by road transport only in disassembled form. Assistance in transporting Belaza can be provided by Optimal Logistic. Transportation is carried out within the agreed time, without delays. As force-majeure situations, as a rule, we do not arise. 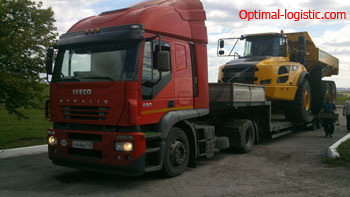 Carrier equipment, namely BelAZ, requires special attention during transportation. The weight of these dump trucks is from 20 to 450 tons. Technicians of this level can not reach the destination independently, so you should use the delivery of the cargo to the destination. will contact you to confirm the order. Optimal Logistic Company provides all types of vehicles, accompanies the cargo on the entire itinerary, performs insurance in accordance with the legislation, and also helps in processing documents for customs control (if necessary).